Earlier this week, Dr. and Mrs. Yellin had the opportunity to visit Carmel Academy, a private K-8 school located on a lovely 17 acre campus in Greenwich, Connecticut. Carmel is a Jewish day school, and religious instruction and Hebrew language lessons are part of its curriculum. 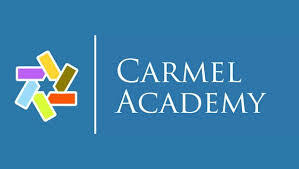 But what makes Carmel Academy unique is the way it integrates a special education program - Providing Alternative Learning Strategies (PALS) - with the general curriculum in which most Carmel students participate. As Jonathan Holub, the Head of the PALS program, explained during his informative tour of the campus, there is a great deal of fluidity between the regular and the PALS classes. Students in the general education track who need some additional support in a particular subject may become part of a PALS class in that subject. Likewise, PALS students who can handle a more advanced class in one or more subjects may spend part of their day with typically learning students. The class schedule for each grade makes this flexible arrangement possible. Students in the PALS program thus feel very much a part of their grade and typical learners interact with the PALS students in class and across other school activities. The PALS program notes that its basic tenet is that their students are not expected to to meet the demands of the curriculum; the curriculum is expected to adapt to the needs of the student. Small classes, capped at ten students with two teachers in each class, provide hands-on, multi-sensory instruction. Notably, both general and Judaics teachers have special education training. Instruction is thematic and interdisciplinary, so that subjects are connected across all academic areas. All students are involved in general and Judaic instruction, but the depth of Judaic instruction is individually determined for each student. On site professionals include occupational therapy (and a sensory gym), speech and language therapy, Orton-Gillingham and Lindamood-Bell reading specialists, a school psychologist and full time nurse. Outside consultants are brought in when needed. Clearly, Carmel is not for every student, even for every student seeking a Jewish day school. The PALS program focuses its curriculum on students with language based learning disabilities and would not a good fit for a student with significant emotional difficulties. For families seeking a Jewish religious school with integration between special education and regular curriculums, Carmel is definitely worth exploring.